THP 1-13-031 MEN (Mill Smith THP) Campbell Timberlands, 565 acres; 70% selection, 23% clearcut, 7% commercial thin logging. Mill Creek, Bear Haven Creek, Campbell Creek (MD: T19N R16W Sec.3, 4, 5, 6, 7, 8, 9, 10; T19N R17W Sec.1, 2, 12; T20N R17W Sec.35, 36). Wet weather operations, high erosion hazard, landslide terrain, road failure sites, debris slides, steep slopes up to 85%, impaired 303.d watershed, coho watershed, herbicides, 12+ spotted owls within 1.3mi, trees up to 54" dbh. Estimated public comment deadline: 05/28/13. 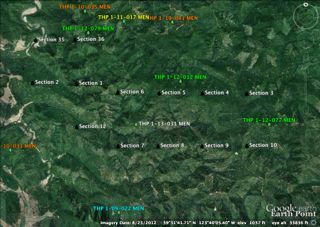 This THP is about 8 miles NE of Fort Bragg, at an elevation of 160 - 1,600 feet in the 10 Mile River drainage which is listed as impaired for sediment and temperature. Campbell Timberlands is planning a tractor and cable logging operation in coastal redwood and Douglas fir forests on very steep and in some places unstable slopes. There are 22 unstable areas including dormant landslides, deep seated landslides, shallow landslides, debris flow, debris slide, down dropped road and cut bank failures. 107 road drainage work projects are planned including ditch work, crossing work, culvert work, road stabilization and rocking to mitigate erosion. Campbell Timberlands is planning to use tractors on steep slopes in cable logging units to yard and end line logs, and near streams on roads in 6 units. 25 trees will be felled at 6 sites in Unit C into Smith Creek stream channel to create a large woody debris and habitat complexity project for Coho. This project also includes the selective logging of 13 of the largest trees in Unit C stream channel to increase sunlight exposure. There is occupied and unoccupied marbled murrelet habitat adjacent to haul roads and rock pit areas outside of THP area. Logging is planned in Unit O within 1,000 feet of spotted owl site MEN0312. More information is available on the THP Tracking Center website.